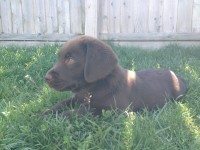 Are you looking for a puppy obedience class in Northern Kentucky or the Greater Cincinnati area? Chances are you have multiple locations to choose from, but not all of them are created equally. There is more to choosing a puppy training course than picking between a privately owned business and a big chain corporation. If you follow these 5 guidelines, you are sure to find a training course that you and your pup will enjoy. Any dog training class you take should only use positive methods. Make sure the trainers and facility you use don’t allow any aversive tools such as pinch, choke, or shock collars. At New Beginnings K-9 Training we only utilize positive reinforcement and all aversive methods are not only banned, but result in dismissal from class. Force, fear, and pain have no place in a puppy training class nor any other dog training course; just like human children, puppies need a safe and fun environment to learn in. When it comes to a puppy training course the primary concern should be socialization. The most important thing your puppy needs to learn early on is how to cope with the human world so they can be happy (check out the blog “Why ‘Sit’ Can Wait”). A puppy class should be no less than 40% socialization; here at New Beginnings K-9 Training we take puppy socialization very seriously. Our Puppy Class shows you how to socialize your puppy in a variety of situations; we even teach you how to get your puppy to love handling for grooming, the vet, and in the home. Playing with puppies is not the only socialization nor is it the most important type. Play between puppies can be a great part of a class if it is done properly. However, puppies come in all different shapes and sizes and play can quickly turn into a free-for-all. Larger puppies can easily learn to bully smaller younger pups; even if puppies are of similar size and playstyle they can learn rough inappropriate behavior from each other. At NBK9 we no longer allow puppies to play during class because they were learning more bad behaviors from each other than good. There are other ways to socialize your puppy to dogs, such as a structured doggy daycare, so they can meet other dogs without learning bad habits. Doggie daycare can also help them burn off some of that puppy energy! If a class does have playtime in the schedule it should be no longer than 5 minutes and any inappropriate behavior, like bullying, should end the play completely. In order to get more individual attention you will want a class that has fewer students and more teachers. It is also important that the there is plenty of space for you and your puppy so you don’t feel crowded. We keep a group class ratio of 4 puppies to 1 trainer so the puppies can be comfortable and their parents can get as much help as they need individually. Think you have found the right class for you and your puppy? First, ask if you can observe a class before you enroll. Most businesses will gladly schedule for you to sit in a class so you can get a feel for it. Observing a class will ensure there are no surprises; this will also give you a chance to ask current students about their experience. A puppy training class should be fun and educational. The right class will teach you even more than your puppy. After completing a puppy training course you should have a better relationship with your pup. Following these 5 recommendations will lead you to a training class that you and your puppy are sure to love.